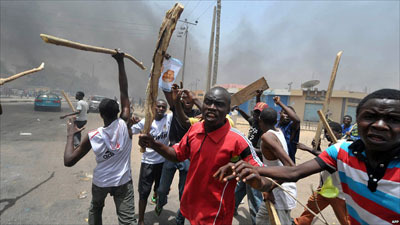 One person was killed and several others injured when two cult groups clashed in some parts of Ibadan, the Oyo State capital, yesterday. Activities were paralysed at Oritamerin and Oja’ba. Traders in the densely-populated markets were said to have scampered for safety to avoid being hit by stray bullets. Though some eyewitnesses claimed that more than one person was killed in the clash, police spokesman Adekunle Ajisebutu confirmed that only one died. It was learnt that the chaotic situation is a daily occurrence in the areas as rival groups constantly engage each other in supremacy battle over trivial issues. It was gathered that the crisis started three days ago but reached a climax yesterday. The two groups were said to have clashed over collection of fees from a truck. Before policemen and armoured personnel carriers were deployed in the areas, it was learnt that the hoodlums capitalised on the crisis to loot some shops. The hoodlums were said to have made a bonfire and blocked the road. Some of the hoodlums were arrested by the police.